Confronting climate change’s root causes, Capitalism vs. the Climate organizes non-hierarchically and takes direct action in solidarity with communities most impacted by the climate crisis. We’re members of Rising Tide North America. We started in 2012 in CT, a group of people angry that society is rushing headlong off the carbon cliff. We see modern capitalism as forcing us to rip up the earth and burn all its fossil fuels. Countless livelihoods and and lives are at stake. Green tinkering won’t cut it. We need fundamental democratization of our energy and our society. In the summer of 2013, 4 CvC members blockaded the entrance to UBS’ American headquarters in Stamford, CT to protest mountaintop removal. 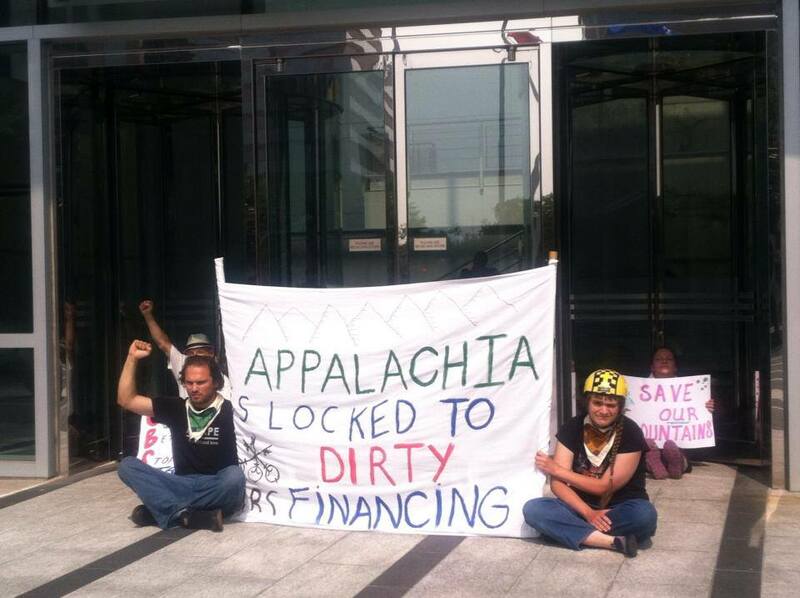 Then, in November, we teamed up with Hands off Appalachia and RAMPS and made headlines as 14 people were arrested. CvC helped bring together 90 CT residents to discuss a global transition to 100% renewable energy. Shortly afterwards, the eminently mainstream CT Sierra Club endorsed a goal of 100% renewable energy in less than 17 years! 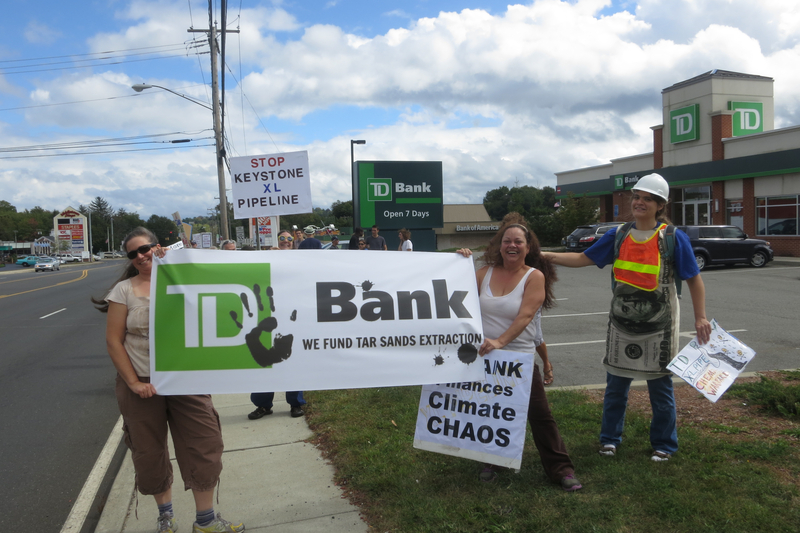 We brought together 65 people to picket Keystone XL financier TD Bank in Middletown, CT. It was one of a series of biweekly pickets and a banner drop we organized that educated hundreds of people about the tar sands. 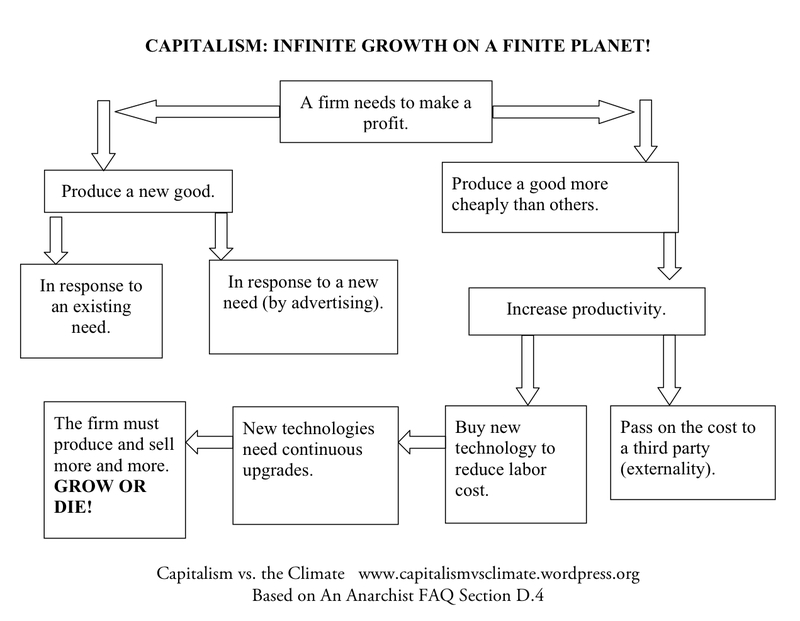 Capitalism presents each business with a stark choice to either “grow or die”. If businesses don’t keep producing more stuff, they lose out in a game of cutthroat competition. And because renewable energy tends to cost more than fossil fuels, a company that truly goes green will usually lose market share to its competitors very quickly. So, the vast majority of businesses have no choice but to keep on using fossil fuels. In practice, when large corporations dominate governments and gut agencies like the EPA, capitalism gets even more destructive than it does in theory! To appear sustainable, they sell the public false “solutions” like natural gas, mega-hydro, nuclear power, and cap-and-trade. We call these false solutions, because they rely on the very same oppressive, capitalistic structures that caused climate change. In some cases, these false solutions increase greenhouse gas emissions. “Clean” natural gas pollution, for example, is many times more potent than carbon dioxide, leading Cornell scientists to conclude natural gas is worse than coal for the climate. Even when capitalists switch to renewable energy, they build it in a very destructive manner. We need a democratic system capable of putting people and the earth above private profit. And see our Articles page!